“Overlying Intention”: A watchful eye of guidence and wisdom from outside of the time stream. History: The eye of Horus. Symbolizes healing and protection. The Eye of Horus (originally, The Eye of Ra) is an ancient Egyption symbol of protection and power, from the deity Horus or Ra. In the Egyptian language the word for this symbol was “Wadjet. Horus was an ancient Egyptian sky god in the form of a falcon. The right eye represents a peregrine falcon’s eye and the markings around it, including the "teardrop" marking sometimes found below the eye. As the wadjet (also udjat or utchat), it also represented the sun, and was associated with the Sun God Ra (Re). The mirror image, or left eye, represented the moon and the God Tehuti (Thoth). The ancients believed this symbol of indestructibility would assist in rebirth. The Eye of Horus was found under the 12th layer of bandages onTutankhaman’s mummy. 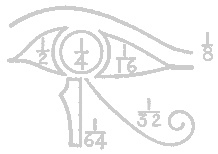 The eye is represented as a figure with 6 parts. These parts correspond to the six senses- Touch, Taste, Hearing, Thought, Sight, Smell. These are the six parts of the “eye”. The eye is the receptor of “input”. It has these six doors to receive data. The construction of the eye follows very precise laws. The senses are ordered according to their importance. And according to how much energy must be “eaten” by the “eye” for an individual to receive a particular sensation. All of the sensory data input is “food”. In the Ancient Egyptian measurement system, the EYE OF HORUS represented a fractional quantification system to measure parts of the whole.